Taipei, you beautiful little surprise. Initially just a layover as a hopping off point to Southeast Asia, we decided to spend longer after our travel friends raved about this place. They weren't wrong - Taipei is now one of our favorite cities. Taiwan's culture reflects it's long history of occupation by the Dutch, the Spanish, the Japanese (for nearly a decade) before reverting back to the People's Republic of China at the end of WW2. But to be clear, Taiwan is Chinese in name only. Culturally, Taiwan feels like Japan. The people are polite to the point of being deferential, friendly and keen to avoid confrontation at all costs. Social embarrassment is easily caused and difficult to remedy. They are sticklers for cleanliness—street sweepers are constantly ensuring the streets were absolutely pristine. Service and hospitality, from the big hotels to the tiniest restaurants, made us feel simultaneously like honored royalty and close family. The country is a working democracy, one where people openly criticize the government without fear of retribution. Nor does Taiwan pay any provincial taxes to China. But this is the extent of it's independence. Despite the Taiwanese people passionately yearning for sovereignty, it's still a whispered dream...anything louder will bring the Chinese warships into Taiwan’s harbor. Independence matters deeply to the Taiwanese people, both young and old. As long as Taiwan isn’t recognized as a sovereign state, it cannot join the UN or grow as an economic superpower. It isn’t even invited to regional aviation conferences, despite being home to two of the biggest international airlines in the region. Instead the Taiwanese people focus on more subtle mutiny. They embrace Western culture with a passion, as the more Western you are, the less Chinese you are. While Mandarin is the official language, also taught in schools, the language of the people remains Taiwanese. They travel at every opportunity and it's common for most Taiwanese firms to have an ‘annual office holiday’ in another country. 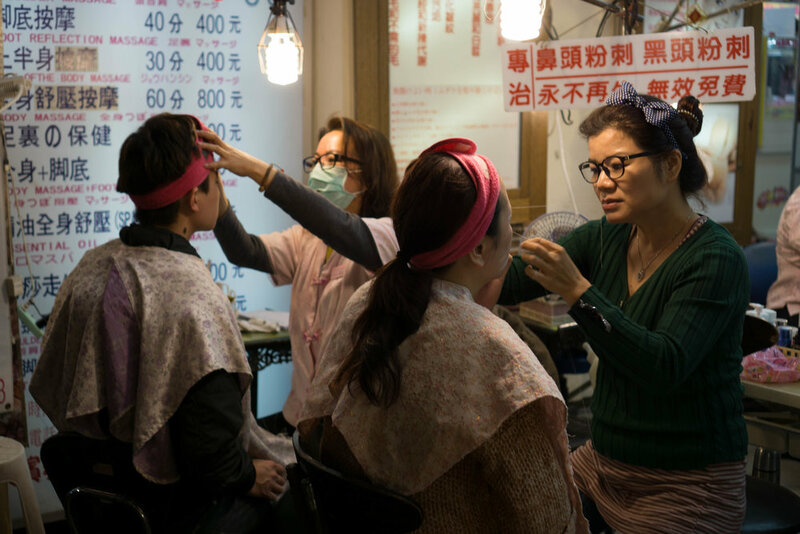 This includes our hairdresser, who took his staff to Japan for a week! Taiwan's most famous export is Din Tai Fung, purveyor of the best dumplings in the world. Testament to this is the dumpling chain's locations all over the world, and the lines that accompany every location. The Xiao Long Bao (soupy pork dumplings) are a speciality, made by placing a frozen disc of stock alongside the pork filling inside the dough. When the dumpling is steamed, it melts the stock and cooks the meat, creating something close to a divine experience. But the real must-do in Taipei is sushi. Japanese tourists flock to the city for "sushi excursions" as the seafood and the value for money is far better. 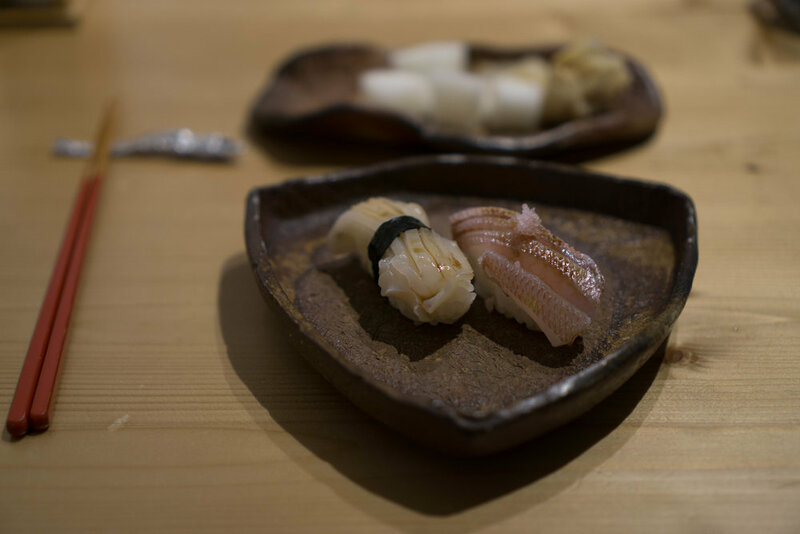 The best sushi places follow the Japanese tradition--very, very small restaurants seating fewer than 15 people and serving omakase (chef's choice) only. We went to Nomura, where we snagged the last table (make a reservation for sure), and ate some of the freshest, most unusual sushi we've ever had. While there is plenty of fine dining in Taipei, street food at night markets remains king. While there are plenty to choose from, Raohe Night Markets is one of the most accessible. Everyone can find something they'll enjoy from the fried chicken and spicy fried tempura mushrooms at Maguro, to clay oven baked pepper pork buns (yeah, there had portable clay ovens and yeah, it tasted like naan wrapped around heaven). The market is teeming with tourists and locals alike, eating, playing games, getting their brows done, and buying fake Nikes. Asian breakfast buffets at big hotels are our biggest weakness, and the W Taipei did not disappoint. With a massive spread of made to order noodle soups, dim sum, eggs stations, a juice guy, pizza, pastries, a GELATO BAR and just about anything else you could think of, it was impossible to control ourselves. If breakfast isn't your thing, the afternoon tea at Mandarin Oriental came highly recommended, although we couldn't stretch our bellies to fit it in. To detox from all the gorging, we ventured out to the hotsprings for the day. Taipei is in a valley surrounded by a low mountain range, and nestled in the clifftops about 1.5 hours away is Wulai. By a river, on top of natural hot springs, the town is a page out of old Japan. Small hotels, a tiny village and a few teahouses that serve oolong (Taipei's speciality tea), there was sense of peace and solitude up there in the mists. We got a private room at the Pause Landis Resort and soaked away a day.